Parabolic trough linear receivers, or heat collection elements (HCEs), absorb sunlight focused by the mirrors and transfer that thermal energy to a fluid flowing within them. The receivers are vacuum-sealed and embedded in a glass body and play a key role in the efficiency of parabolic trough power plants or industrial solar thermal parabolic collectors. They convert the solar radiation to heat. The sheath usually consists of coated, highly transparent and robust borosilicate glass. Most state-of the-art receivers have an anti-reflection coating which has a high abrasion resistance and at the same time allows the transmission of more than 90 percent of the sun’s radiation. The absorbing tube of these receivers typically operates around 400° C (752° F). 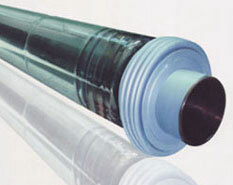 HCE manufacturers prevent thermal loss from the absorbing tube to the environment by using sputtered selective cermet coatings on the absorber and by surrounding the absorber with a glass enclosed evacuated annulus. HCEs are designed to minimize heat loss to the environment while letting in and absorbing as much sunlight as possible. Several design features that make this possible. 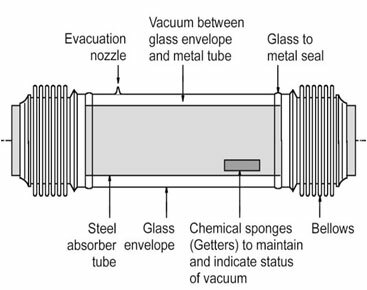 The annulus between the absorber tube and the transparent glass cylindrical envelope is evacuated to prevent heat conduction/convection from the hot absorber tube to the cooler glass envelope. Radiative heat loss from the absorber is minimized by coating the absorber tube with a selective surface that has high solar absorption but low thermal emittance. The effect of heat conduction at the ends is reduced by making long HCEs. Finally, the diameter of the absorber is small relative to the collecting aperture of the reflector, thereby decreasing the surface area associated with heat loss.